Established in 1926 and originally named Farm Bureau Mutual Automobile Insurance Company, Nationwide (as it was renamed in 1955) is one of the largest diversified insurance and financial services organizations in the U.S.. A Fortune 100 company, Nationwide has over 30,000 employees and has some interesting #1 claims: #1 insurer of farms and ranches, #1 provider of public-sector retirement plans, and #1 pet insurer (!). It’s also the 7th largest homeowner and auto insurance provider. Structurally, Nationwide operates under multiple names across states and types of insurance, including Allied Insurance, Harleysville Insurance, Nationwide Financial, Scottsdale Insurance, Crestbrook Insurance and Veterinary Pet Insurance… looking to bring everything under one name and one brand, Nationwide (re-)introduced a new logo last week designed by Chermayeff & Geismar & Haviv as part of a larger repositioning campaign by Ogilvy & Mather. Today, we are proud to announce the updating of our logo to the Nationwide N and Eagle. The logo symbolizes the strength, stability and security of the company that stands behind the On Your Side® promise. Logo detail, single- and full-color. Part of what I found interesting about this story is that, in research, Nationwide found that there was more recognition and awareness of the N/eagle logo than there was in the frame logo. It’s not that the N/eagle is better, but that’s the more common association that comes to mind to people. Because the frame logo has been in use since the late 1990s it’s the only logo I recognize for Nationwide and I’ve always thought it’s one of the more interesting insurance logos out there. For a while, their advertising even revolved around the frame. So my initial reaction wasn’t entirely positive about its loss, but the reasoning makes sense. 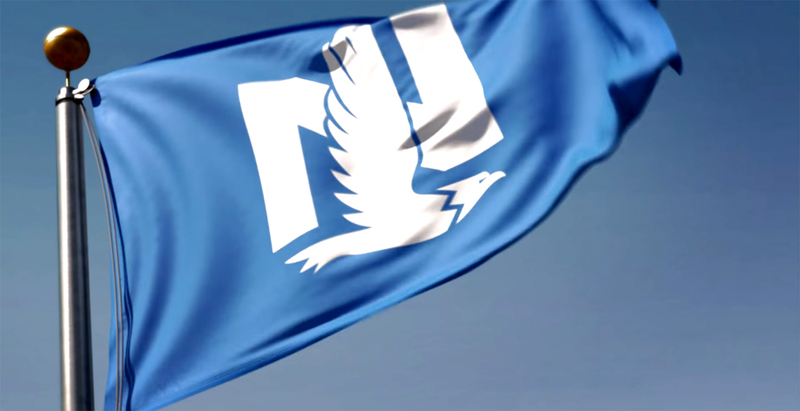 The Nationwide “N & Eagle” logo first appeared back in 1955 when the company was known as Farm Bureau Mutual. The company has been using the blue box logo called the “Frame” since 1998, but the eagle has been making a comeback of late, appearing briefly on a waving blue flag at the beginning of ads in its ongoing “Join the Nation” campaign, which started in 2012. The company decided to put the eagle back where it belongs after research that revealed it had a 50% higher brand awareness association with Nationwide than the blue box. Jauchius calls the eagle a unifying mark to unite the company under the Nationwide name. Of course, the eagle is still quite far removed from its elder cousin, with a redesign from Chermayeff & Geismar & Haviv to make it look more real and imposing. A comparison of the old N/eagle and the new one. It’s almost more fair to compare the old N/eagle with the new one — although the über simplicity of the frame was hard to beat — and by that measurement it’s a modest and successful improvement, making the eagle more streamlined, energetic, and striking. At small sizes though, if you check their website’s footer, the logo becomes very difficult to read. Logo on the flag, from the opening shot of the new TV spot. 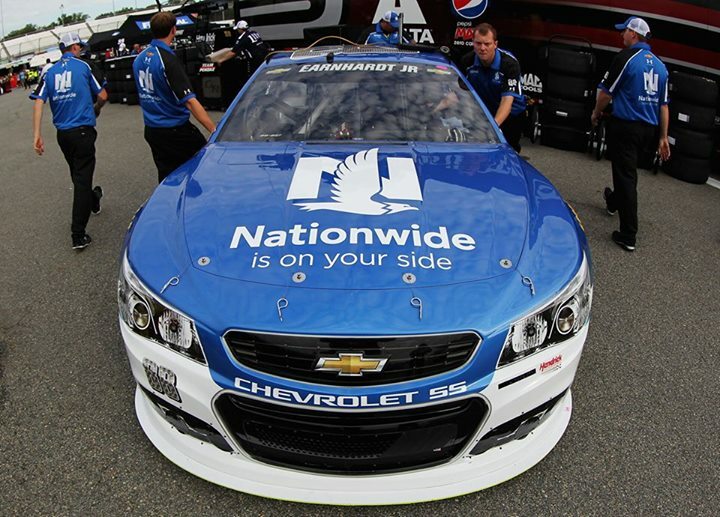 The new paint job of Dale Earnhardt Jr.’s car, sponsored by Nationwide. Leveraging one of its most powerful branding assets, Nationwide unveiled its first television advertisement featuring Denver Broncos quarterback Peyton Manning. The ad, titled “Jingle,” will debut during Thursday Night Football on Sept. 4 and will run throughout the National Football League season. “Jingle” shows Peyton’s light-hearted side as he incorporates the widely recognized “Nationwide is on your side®” jingle into various aspects of his daily routine. New “Jingle” spot with Peyton Manning. 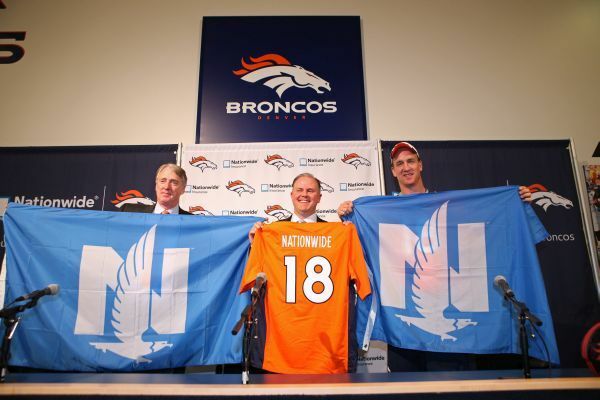 Introducing Peyton Manning as the spokesperson for Nationwide along with a broader partnership with the Denver Broncos. Story here. The new logo was introduced with a catchy new TV spot by Ogilvy & Mather, in which NFL quarterback Peyton Manning sings about the things he’s doing to the tune of “Nationwide is on your side”, an old-school corporate jingle that dates back to 1973 and also done by Ogilvy at the time. Manning’s good-natured face makes the silly tune contagious and almost impossible to avoid doing it yourself. Overall, this is an interesting approach from Nationwide, sort of going back to basics and its roots instead of trying to barrel ahead with a completely new look or advertising campaign. I’m not fully endorsing relying on things of the past but sometimes backwards is a valid way forward. Thanks to Dave Fowler for the tip. Established in 1926 and originally named Farm Bureau Mutual Automobile Insurance Company, Nationwide (as it was renamed in 1955) is one of the largest diversified insurance and financial services organizations in the U.S.. A Fortune 100 company, Nationwide has over 30,000 employees and has some interesting #1 claims: #1 insurer of farms and ranches, #1 provider of public-sector retirement plans, and #1 pet insurer (!). It's also the 7th largest homeowner and auto insurance provider. Structurally, Nationwide operates under multiple names across states and types of insurance, including Allied Insurance, Harleysville Insurance, Nationwide Financial, Scottsdale Insurance, Crestbrook Insurance and Veterinary Pet Insurance… looking to bring everything under one name and one brand, Nationwide (re-)introduced a new logo last week designed by Chermayeff & Geismar & Haviv as part of a larger repositioning campaign by Ogilvy & Mather.